My Press is a portable, lightweight rosin press designed for personal use. It is manufactured in Denver, Colorado. It’s made with high-quality materials to ensure a high-quality final product and to have the longest possible lifespan. It will require just two things to work correctly, and these are heat and pressure. The rosin press uses the solvent-less technique to create cannabis rosin and to eliminate any solvent contamination of the cannabis end-product. You won’t have to clean the machine of solvent impurities, and this will save you lots of time and effort. 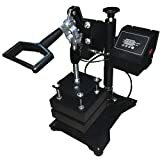 My Press rosin press is a very small and lightweight machine meaning that you can take it anywhere you want effortlessly. The machine weighs 13 pounds. This rosin press is ideal mainly for personal use in your home. 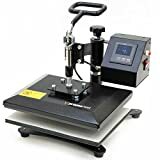 This portable rosin press comes with 3 x 3 stainless steel Axiom plates that are able to deliver a range of heat between 160 degrees Fahrenheit up to a maximum of 280 degrees Fahrenheit in 10-degree increments. The plates offer enough space to be able to process your cannabis materials most efficiently. The plate size is 3.07 x 3.07 inches, and they are made from stainless steel. The maximum pressure is of six tons. My Press rosin press comes with a few safety features. The included pressure adjusting wrench lets you adjust the pressure keeping your hands away from the heated plates while the press is running. The press automatically powers off after 30 minutes of no activity. My Press is designed so that it stays in a closed position when you are not using it. This means that the plates will not be exposed or touched by accident. If the press’ heat exceeds 400 degrees Fahrenheit, the machine will automatically power off. The plates and frame are grounded. 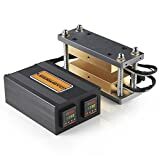 My Press rosin press comes with a single LED counter display that will make sure to show you exactly how much time your cannabis material is placed under heat. This way, you’ll be able to get enough control in order to get the best possible final results. This machine will help you produce the highest-quality rosin. The counter will start to work just as soon as the axiom plates are closed. The timing will freeze on the LED display when the plates are opened again. All you have to do to get the best rosin is to learn all the necessary information about the material you are going to press, amount, temperature, required pressure and the time needed for your material to be pressed. My Press rosin press will provide the best results in the most efficient manner as long as you set the correct time and temperature. After I got My Press rosin press at home, I was impressed to see its small and compact design. I have been using it for half a year, and I never had any troubles with it. It takes about 20 to 25 minutes for the plates to heat up and this usually depends on room temperature and the desired plate temperature. My Press will take about an hour to cool down. Practically all you have to do is to adjust the pressure properly. You have all the necessary information included in the instructions, but I will also share a few tips with you. First, you have to use the wrench tool that is located on the back of the machine. Then, you have to place the unit in the Open position by lifting the operating handle. Now, you have to rotate the Adjusting Nut counter-clockwise until it stops and place it into the Closed and Locked position by lowering the operating handle. Then, rotate the Adjusting Nut clockwise until the heated plates touch each other. After that, place the unit into the Open position by lifting the operating handle and rotate the Adjusting Nut ½ to ¾ turns clockwise. If you need more pressure, just rotate the Nut in 1.4-turn increments. I can tell you that this rosin press blew my mind with the flawless way that it works. It’s effortless to use, and I highly appreciated all its safety features. 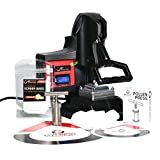 I recommend My Press rosin press to any cannabis enthusiast without hesitation. 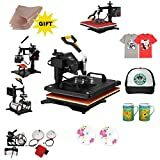 My Press rosin press is highly portable, and it’s the perfect pressing machine for home and personal use. Using the pressing machine is effortless. It comes with a lot of safety features that are extremely beneficial for the user. My Press rosin press comes in a size similar to the one of a coffee maker. My Press rosin press is made with high-quality materials, and this will ensure an extended lifespan. With My Press rosin press, you will not be able to produce large amounts of rosin at once, considering its small size. But for your daily personal use, this solvent-less rosin press will turn out to be your ideal companion in making the highest-quality rosin. 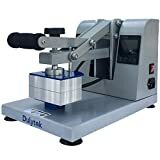 My Press rosin press is under limited warranty when you receive the machine. It comes with a ninety-day warranty on its major components, circuit boards and all other parts due to failure from manufacturer defects. The product is made in Denver, Colorado, so, in case you need to replace some parts, it will not be difficult. The manufacturers have spent two years engineering My Press from scratch specifically to press rosin. Customer service is always available by telephone or email to answer all of your questions about the proper use of the rosin press. My Press rosin press is one of the best rosin presses I have ever tried. It comes with a very compact design, but it’s packed with features for both your safety and for making the highest-quality rosin. The instructions that are included in the package are incredibly detailed, and they’ll help you get the hang of this rosin press in no time. Overall, My Press is the ideal rosin press for personal use.